Every May, cyclists across the country join together to promote National Bike Month. Sponsored by the League of American Bicyclists. The events are National Bike Month, National Bike to Work Week (May 13–19), Bike to Work Day (May 17) and National Bike to School Day (May 8). All events showcase the benefits of cycling and encourage more people to use a bicycle for their health and transportation needs. Many large cities with miles of bike lanes such as Boston, Chicago, Portland, Ore. and Denver have special events on Bike to Work Day meant to encourage more residents to ditch their cars. Boston is holding a National Bike to Work Day Festival on Bike to Work Day and Portland is hosting the Bike More Challenge 2019 where businesses compete against each other to see who can get the most staff to ride a bike during the month of May. Some cities choose to host additional bike to work events in June with the hope of better weather. Chicago has a bike to work challenge in June called “Chicago Bike Week” that includes a two-week long competition where workplaces compete against each other, by earning points for employees who bike to and from work. In addition to urban transportation events, National Bike Month is a great time for colleges, bicycle retailers, cycling clubs and race organizers to promote the benefits of cycling. Host a low or no cost event like a free safety inspection, helmet fitting, bike tuning workshop or organize a group ride. Schools also generally welcome bicycle experts who will do in-classroom bicycle safety presentations. Whether you are spearheading a municipal Bike Month event or a corporate sponsor of one, promotional products will further highlight the benefits of cycling and promote your organization’s name. 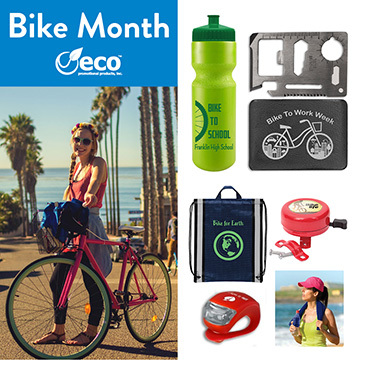 Following are the top promotional products for National Bike Month 2019. Bike Light: Cyclists of all ages will use a promotional LED bicycle safety light. Eco Promotional Products’ compact bicycle energy efficient LED silicone safety light has three settings: constant, slow flash, fast flash. The light’s innovative silicone mounting wraps around handlebars, seat posts or the frame. Bike Bell: Not just for kids, bike bells help riders and pedestrians stay safe. Promotional bike bell’s melodic sound is full and old-fashioned. The perfect accompaniment for cruisers, comfort and town bikes. Cinch Backpacks: Recycled safety drawstring backpacks are tear-resistant, water repellent and feature 1" safety reflective stripes which help cyclists stay visible when riding at dawn or dusk. Lightweight design allows for easy carrying while cycling. Stainless Steel Bicycle Tool: Seasoned cyclists will love receiving a stainless steel bicycle tool. This credit card size multi-functional survival tool includes a can opener, knife edge, screwdriver, ruler, bottle opener, 4-position wrench, butterfly screw wrench, saw blade, compass indicator, 2-position wrench and a keychain hole. Cooling Towels: Reusable cooling towels are ideal for staying cool on hot days. Simply wet, wring and wear. PVA material is a lightweight, hyper-evaporative material that's the latest in cooling innovation. Towel retains water while remaining dry to the touch to provide cooling relief. Wear for hours or wipe off for quick relief. Water Bottles: Water bottles are a must for staying hydrated while cycling. Eco Promotional Products’ bike bottles feature a heavy wall design for multiple use and contour grip neck. This bike bottle can handle all rugged conditions. While National Bike Month events require a lot of preplanning and effort, members of the cycling community are very loyal. Keep your organization or brand top of mind with custom imprinting on the best eco-friendly bicycle promotional products.